Many pilots sweat the approach and landing to an unimproved, high mountain airstrip and are gratified by a safe arrival. But how much thought has been given to departing that grass or dirt strip at 7000 feet elevation with high terrain lurking in all quadrants? Experienced mountain pilots treat takeoff and departure from high elevation unimproved airstrips as the most critical phase of flight. Typical summer afternoon Density Altitude (DA) can easily exceed 10,000 feet at many mountain strips, and the associated decrease in airplane performance is enormous. The takeoff ground roll at high DA is significantly increased due to reduced engine power, loss of propeller efficiency, and higher groundspeeds. Grass, dirt, sand, and gravel can greatly lengthen the takeoff roll. Climb performance is also drastically reduced. The best technique is a combination short-soft field takeoff. Holding brakes while applying maximum power is not recommended when operating from unimproved strips; it can throw rocks and debris into the propeller, fuselage, and horizontal stabilizer. It is best to keep the airplane moving smoothly from taxi to takeoff roll and avoid sudden bursts of power. An engine check can be done during taxi, or by doing a runup at a spot with minimum debris. For tricycle gear aircraft, use just enough back pressure initially to lighten the nosewheel as soon as possible and let the airplane fly itself off the runway and into ground effect. In most taildraggers, let the tailwheel come up when it is ready and takeoff tail low, allowing the airplane to fly itself off. Both nosewheel and taildragger pilots who have no experience with high altitude takeoffs are usually amazed at how long the airplane takes to accelerate. However, at high DA indicated airspeed will be lower than groundspeed, giving a false sense of acceleration. A common and dangerous mistake is to over-rotate in an attempt to force the airplane off the runway when the pilot “feels” the airplane is ready. Over-rotating can cause the airplane to climb out of ground effect, stall, and drop back onto the runway, which can eat up a lot of needed real estate during the takeoff roll. Patience is the primary skill needed to perform a high DA takeoff, especially from a soft field. After breaking ground, reduce the angle of attack and accelerate to climb speed in ground effect. This will transfer the weight from the wheels to the wings as soon as possible without increasing the angle of attack (which increases drag). The key is to find and hold the correct angle of attack for minimum drag while the plane is accelerating in ground effect. A good general rule of thumb is: if you can’t see the end of the runway over the nose of the airplane, the angle is too high. When the wing reaches the correct airspeed the airplane will begin to climb with only minimal, if any, change in pitch attitude or pressure on the yoke or stick. This technique minimizes takeoff roll and maximizes safety by allowing the airplane to fly itself off without the pilot forcing it to rotate before climb speed is obtained. Pilots new to high altitude flying may become alarmed at the enormous reduction in climb rate and try to milk a climb out of the airplane by continuing to pull back and increase the pitch attitude, resulting in a dangerously low airspeed, increased drag, and an incipient departure stall. Pitch attitudes for best angle (Vx) and best rate (Vy) of climb airspeeds are much flatter at high DA than at sea level. It is imperative to learn the correct pitch attitude for the aircraft’s climb speeds at higher DA and to vigilantly reference the airspeed indicator. The same rule of thumb applies: if you can’t see the ground over the nose, lower the pitch attitude. During initial climb, use normal power, propeller, and flap settings recommended for the aircraft. Maintain Vx until clear of obstacles, then accelerate to Vy or cruise climb, as appropriate. When possible, cruise climb is recommended as it provides better forward visibility and allows for increased engine cooling. Changing aircraft configuration while climbing at low altitude over obstacles can be distracting and potentially dangerous. Concentrate on climbing and maneuvering before decreasing power or retracting flaps, particularly in canyons or confined areas. In complex aircraft, know the amount of drag reduction and the retraction time for landing gear. If there is no significant reduction in drag, it may be best not to change propeller, gear, or flap settings until clear of obstacles and established in a positive climb. In some aircraft, such as a Cessna 210, retraction of landing gear may create significant drag while in transit, which could cause the aircraft go from a climb to a descent and settle back to the ground or into an obstacle. A normal traffic pattern departure may not be possible at mountain airstrips; terrain, wind, sun angle, turbulence, and locations of lift or sink may determine the desired departure path. A prepared pilot will study and plan the departure while circling the area during the approach, including the location of emergency landing spots along the departure route. A takeoff abort point should be determined at any high altitude airstrip. On airstrips without gradient, a general aviation airplane must attain 70% of it’s liftoff speed halfway down the runway for a successful takeoff. If you have not attained that speed prior to the halfway point, the takeoff should be aborted. Stopping may not be possible on slippery surfaces, very short strips, or strips with a downhill gradient. In such cases, make a mental note that an abort is not possible and be prepared for emergency options, especially with regard to emergency landing spots along the departure path. The best way to determine a takeoff abort point is to walk the airstrip. Look at the runway surface and note obstacles, holes, ditches, soft spots, and places to avoid during the takeoff roll. Pace the runway off and determine the midpoint, or determine how much runway is needed to stop safely and choose an easily identifiable visual abort point. Make the decision to abort the takeoff if the airplane is not in ground effect and accelerating, with engine instruments indicating full power, by a certain prominent rock, stump, tree, bend in the strip, windsock, etc. that was chosen while walking the strip. Most importantly, after choosing the abort point, use it!! The procedures for soft field takeoffs change when the temperatures rise and altitudes increase. 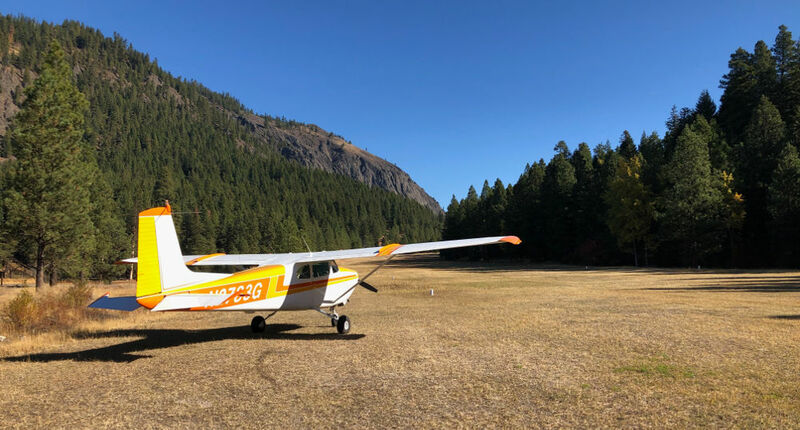 By adjusting your procedures accordingly, you will be able to safely enjoy the many rewards of flying to high mountain or remote canyon airstrips. Published in Pilot Getaways Magazine, 2001. Vol 4, issue 2, pg 58.